This multi-level or stacking spiral stair has a 60" diameter with 22.5 degree treads. Handrail is # 200 (1 1/2" round tubing) and the balusters, one per tread, are # 302 (1" square). The spiral stair treads are made out of a 12 gauge checker plate. Center column was made from 4" OD .135 wall round pipe tube. The finish is a red oxide primer and painted at the job site after installation. Secondary access spiral staircase codes will not be meet with this spiral stair design. 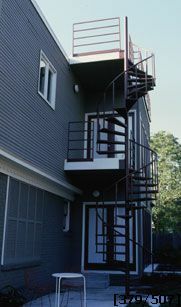 Current spiral stair codes require spacing between balusters to be less than 4"; spiral staircase steps must be 30 degrees; headroom minimum is 6' 6"; and a Stairways, Inc. landing would be required to achieve this height. When code compliancy is not an issue and visual transparency is important, this inexpensive spiral stair design is your answer.